Travel Indochina has launched its 2014-16 Luxury Asia River Cruise Portfolio contained in its expanded 84 page guide amid extremely strong growth in the sector and with a partnership announcement that it will be handling all Australian Travel Trade bookings for the newest small ship luxury cruise in Asia, Aqua Expeditions’ Aqua Mekong. In the three years since establishing the product suite, boutique small ship Asian River Cruising has become Travel Indochina’s second most important market segment following the company’s core Small Group Journeys, registering 130% growth in the last year alone. Managing Director, Paul Hole is buoyed by the growth in the sector which offers travellers a unique opportunity to gain greater access and deeper insights into a traditional way of life along Asia’s most iconic waterways. “Having personally shared the experience of sailing on small boats along the Mekong, I’m more resolute than ever to bring this style of travel to travellers who prefer this style of exploration,” explains Hole. 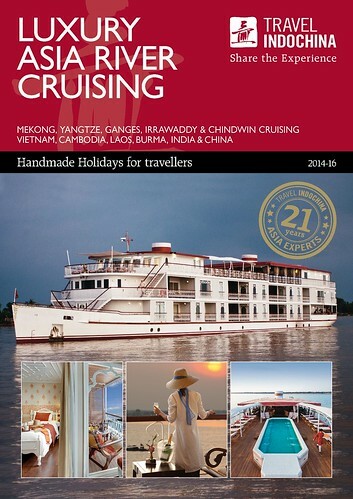 Travel Indochina’s newest guide to Luxury Asia River Cruising, which incorporates Vietnam, Cambodia, Laos, Burma, India and China, includes cruise itineraries and details for boutique small ship river cruising along the Mekong, Yangtze, Ganges, Irrawaddy and Chindwin. The only dedicated brochure in the market with such a large range of boutique river cruising options across Asia, the 84 page ‘Guide’ to cruising provides detailed ship information covering cabin selections, cuisine, on shore excursions, itinerary highlights with pre and post touring options, deck & cabin plans and dates and prices for a range of departures to help travel agents and travellers identify the most appropriate cruise. In addition to the Aqua Mekong, Travel Indochina’s cruise portfolio also includes the addition of two other cruise ships due to launch in late 2014 and early 2015; Haimark Luxury Expeditions’ Irrawaddy Explorer and Ganges Voyager I. Plying Burma’s Irrawaddy River and India’s Ganges River respectively, these two new cruise ships exude comfort and elegance while offering British-colonial era inspired luxury with quality service delivered by exceptionally high crew to passenger ratios. Setting a new standard for small luxury cruising up and down the Mekong River between Vietnam and Cambodia, the Aqua Mekong is the only ship on this stretch of the river to offer a fully equipped fitness centre, library, screening room, outdoor evening cinema, observation deck and a top deck river facing infinity edge style pool. The ship features 20 Design Suites measuring 30m2 and facing the Mekong River. Eight suites have private balconies and 12 panoramic windows with 4 metre sofas to leverage the view. Guests dine on world class indigenous cuisine created by Asia’s top ranked chef, David Thompson, as Executive Chef. Incorporating the Mekong’s diverse culinary traditions, the on board chefs offer guests cooking classes to share Aqua Mekong’s inventive and authentic dishes. Cultural and environmental lectures are also offered on board. Uniquely, Aqua Expeditions has invested in four deck mounted launch speedboats to provide twice or three time daily on-shore excursions. Four professionally trained guides lead guests deep into the Mekong’s tributaries and on foot among Khmer pottery villages, remote Vietnamese mountain monasteries and the cultural treasures of Phnom Penh. There are also ten bicycles aboard the Aqua Mekong to allow guests to ride along the riverbanks. Travel Indochina has been operating Small Group Journeys and tailor-made holidays to Asia since 1993. Offering journeys to Vietnam, Cambodia, Laos, Thailand, China, India, Sri Lanka, Japan, Burma, Mongolia and Bhutan, Travel Indochina has seven offices across its Asia destinations, Western tour guides and English-speaking local guides. Travel Indochina’s idea is simple – to explore and share the essence of Asia’s history, culture, natural beauty and, most importantly, people. The company has a commitment to responsible travel and a belief that travel is an exchange of knowledge and perspectives, cultures and wealth. For more information and bookings, Travel Indochina’s Asia experts can be contacted on 1300 365 355 or online at www.travelindochina.com.au.